Susie Dalton, former Archaeology student in the School of History, Classics and Archaeology at the University of Edinburgh, wrote her MA dissertation on Treasure Trove in Scotland and the reporting of artefacts by metal detectorists. Here she writes on the role of the NFA in supporting museums to make acquisitions through the Treasure Trove process. The National Fund for Acquisitions helps Scottish museums and galleries to acquire a wide range of items of cultural and historical significance. While archaeological artefacts take up a small proportion of the annual grant, they do account for a significant proportion of applications received; in 2013/14 35% of applications were for archaeological material although this accounted for only 9% of total spend. Many of the archaeological finds made in Scotland today by members of the public are made by metal detectorists due to a growth in popularity of the hobby since the 1980s. In the past anything valuable that was found usually ended up going to Edinburgh […]These coins being displayed at the museum is a real coup for us. Meg was referring to a hoard of medieval coins found by a metal detectorist in the Highlands in 2013. The coins, which date back to the 13th century, are now on display in the Centre thanks to NFA funding half the £2,210 ex gratia award and they are expected to contribute to increased visitor numbers. 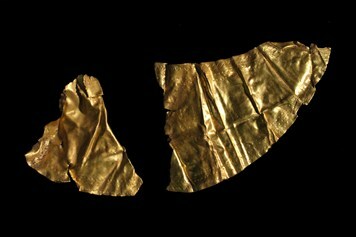 A similar story can be found at the opposite end of the country in Dumfries and Galloway where the NFA helped Stranraer Museum to acquire a remarkable find in 2013 – an early Bronze Age gold lunula (a kind of flat, disc-like necklace), the first found in Scotland in over a century. Contributing a grant of £1,500, the NFA made it possible for a small museum to add this impressive piece to its collections. 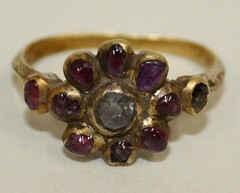 The NFA provides a lifeline to small museums which want to display the archaeological finds made in their area. While the majority of finds don’t require a significant proportion of the NFA’s budget, they do make a considerable difference to small museums and their local communities, especially when many are facing increasing budget cuts. By helping museums across the country to acquire and celebrate these finds, the NFA is allowing Scotland’s heritage to be enjoyed by all. As the number of archaeological finds made and reported in Scotland continues to increase as a result of the TTU’s outreach work, the NFA has an important part to play in ensuring they continue to be seen and enjoyed by as many people as possible. 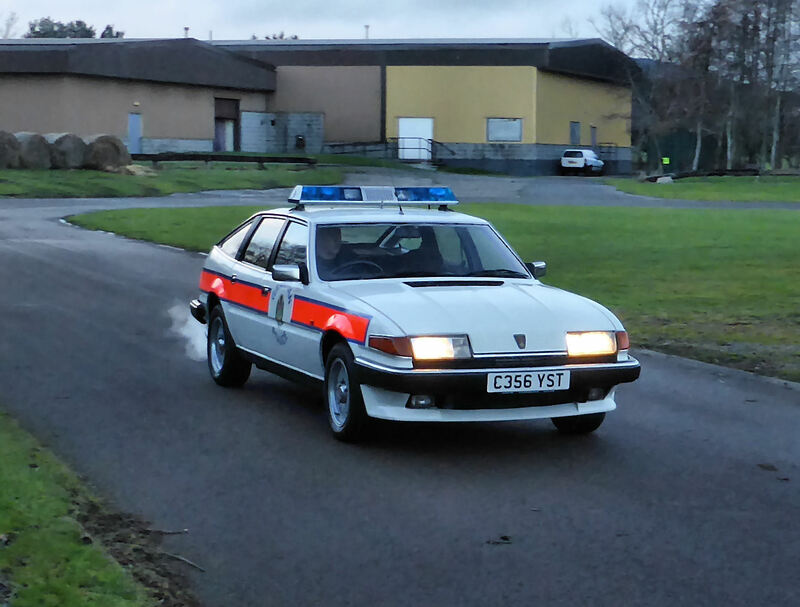 Rover SD1 Vitesse Grampian Police highway patrol car acquired by Grampian Transport Museum in 2015 with an NFA grant of £3,851. 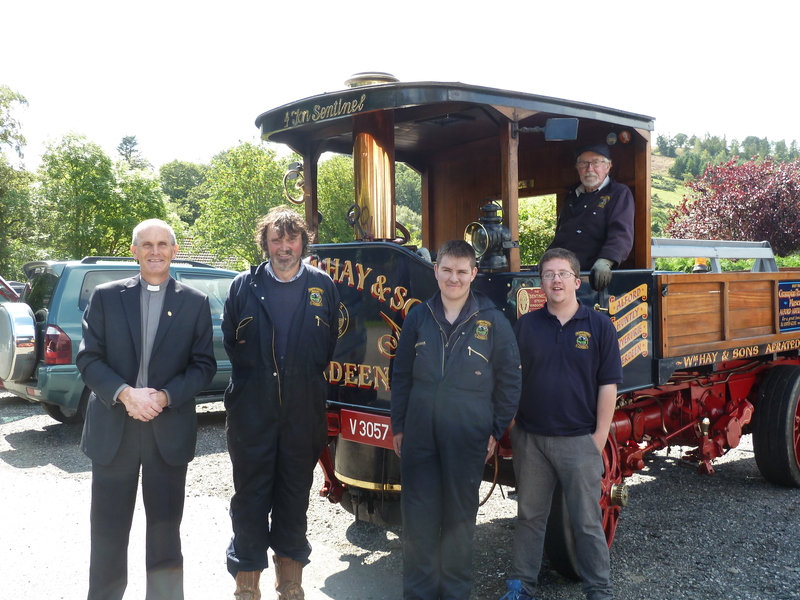 In January 2015 Grampian Transport Museum was successful in its bid to repatriate a former Grampian Police highway patrol car to Aberdeenshire. The Rover SD1 (Special Developments 1) was produced between 1976 and 1986 as a large, high spec hatchback with supercar lines borrowed from the Ferrari Daytona. Rover used a further refinement of their (ex Buick) 3.5L V8 engine and new 5 speed gearbox with 3 speed auto as an alternative for the first cars. Smaller engine and diesel variants followed as a fuel crisis hit the V8’s running costs hard. The car was extremely well received, winning the coveted European Car of the Year award and other accolades. The Rover also established itself in motorsport and so credibility with motorists and performance car enthusiasts was assured. Britain’s police forces tested the car and placed orders immediately. It was the ideal compromise; a big load space and ample performance for the period. The Metropolitan Police ordered hundreds of mostly 3 speed autos and stuck with them through to 1989. 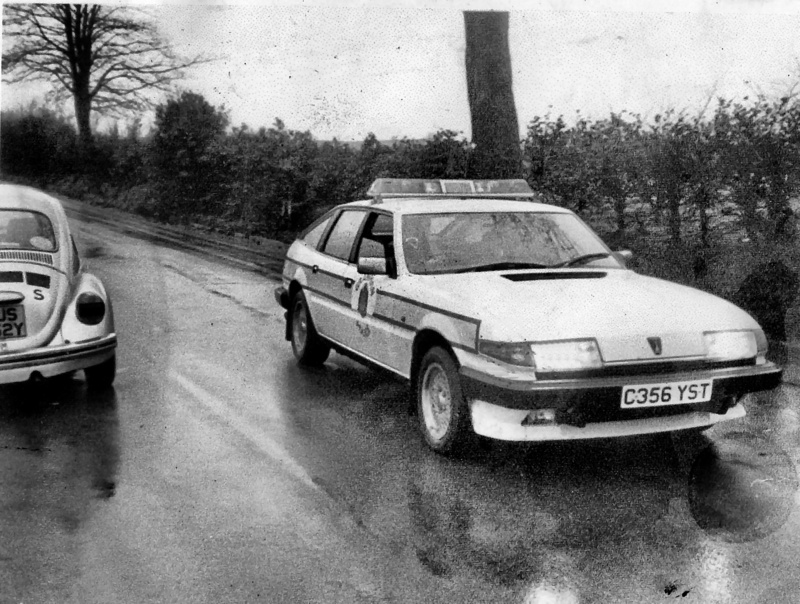 The SD1 is the best remembered original ‘Jam Sandwich’, a new breed of high visibility, high speed police traffic car. 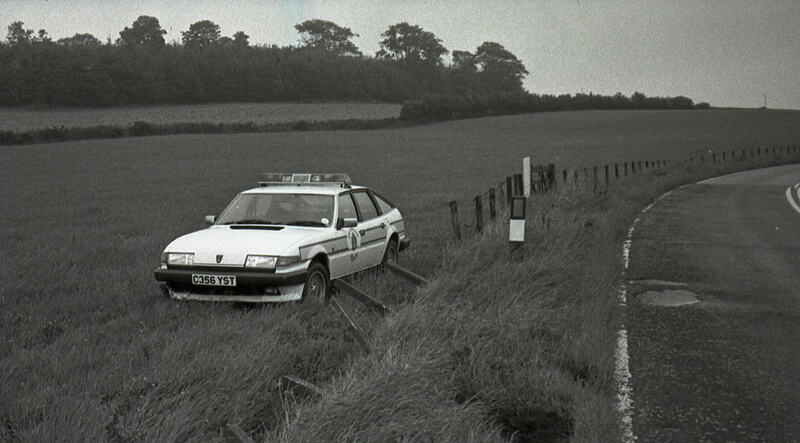 In Aberdeenshire, Grampian Police (now part of Police Scotland) purchased several SD1s and Ford Granadas to control speed and road traffic incidents. The drivers all had their favourites but the SD1’s engine and massive torque won many fans and all agreed the supercar looks were a great deterrent to speeding motorists. The City of Aberdeen underwent huge change as the North Sea oil and gas industry boomed in the 1970s. The city had good sea, air and rail connections but the single carriageway A90 required a rapid upgrade. From 1983 onwards new sections of dual carriageway were planned and constructed, the first being from Aberdeen south to Portlethen. In 1985 the town of Stonehaven was bypassed by a much longer stretch of dual carriageway and the north east had its first section of fast road. Policing this new road was a concern as new wealth had established a flourishing motor trade in high performance cars, led by John Clark Specialist Cars which offered the Audi 100 and Quattro and the BMW range. Grampian Police ordered another SD1, one of the later high performance fuel injected versions of the 3.5L V8 known in civilian trim as the Vitesse, to patrol the bypass and area around Stonehaven. This car used the 190bhp engine and 5 speed manual gearbox of the production Vitesse along with, unusually for a police car, power steering. All other luxury items were excluded from the build to make it lighter and easier to maintain. Police spec suspension gave a higher ride height to facilitate chasing over central reservations and curbs and stiffer handling. The word Vitesse (French for speed) was removed from the steering wheel and the rear badge panel simply bore the Rover name. On 10 December 1985 C356YST took up its station on the Stonehaven bypass and went to work. Those who were enjoying the new road remember it well. It would suddenly appear right there in your mirrors and so would points on your licence or a three month ban. The car became something of a talking point among local car enthusiasts, one commenting ‘you can’t relax until you see it going the other way’. Grampian Police ran the car until 20 July 1988 after a hard life that included three back axles and several crashes. In the hands of a series of private owners the inevitable deterioration took place common to most cars from the period due to poor rust inhibition. In 2014 it was rescued in a partially restored condition by the Channel 4 television programme For the Love of Cars, professionally restored for the programme and acquired by Grampian Transport Museum at auction at the NEC, Birmingham on 10 January 2015. The purchase was rapidly organised and involved a visit to the restoration workshop on 30 December to ensure that this was the actual car and the build was to museum standards. Grampian Transport Museum receives many donations dedicated to adding great exhibits to the collection. Funds had slowly grown to just over £6,000 and the National Fund for Acquisitions agreed to provide up to a further £4,000. 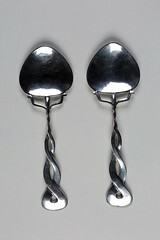 An independent valuation of £10,000 proved accurate with the hammer dropping at £9,750. The old charger is a perfect fit to the museum’s Collecting Policy. It tells a great local story and better still the police drivers are still there and are hugely enthusiastic about its survival and return. Ian Slorach, who drove the car nearly 30 years ago, was at the museum the day after its arrival to give it a test drive round Grampian Transport Museum’s road circuit, commenting ‘over a career in Traffic this was my favourite car, a real police car. I loved driving it.’ Ian has even offered to be its designated driver at future public engagements! 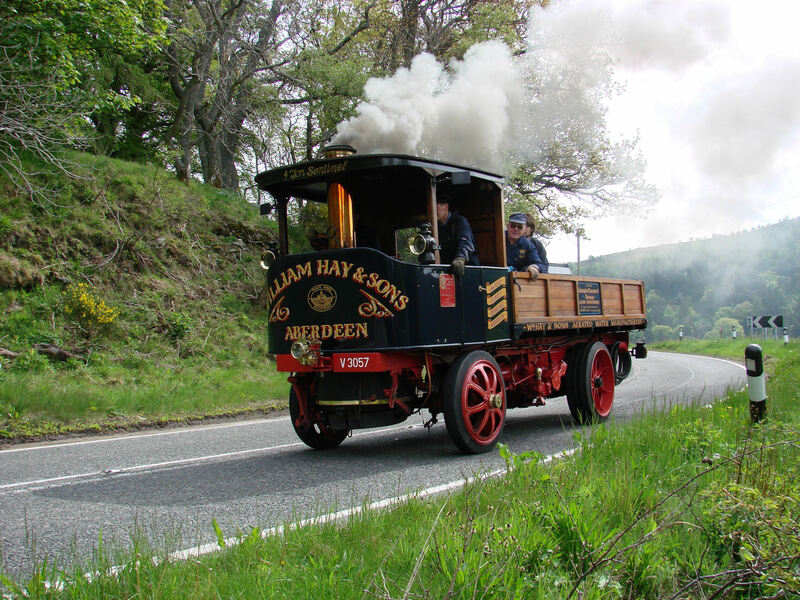 Sentinel steam waggon acquired by Grampian Transport Museum in 2000 with an NFA grant of £15,200. Mike Ward wrote about the acquisition of the Sentinel in a post published on 19 March. Now he’s back with an update on what has been a busy summer for this popular vehicle as it took part in events to commemorate the outbreak of the First World War. Of all historic vehicles, steamers are most often credited with ‘being alive’. There is something about steam … it is almost a natural, living source of power and if that’s true perhaps steam vehicles are the most likely to have personalities. Fifteen years ago the NFA helped Grampian Transport Museum purchase V 3507, a 1914 Sentinel steam waggon (Sentinel’s spelling!) It turned out to be the sole surviving complete and working Glasgow-built example, new to Alexander Runcie, a Carrier from Inverurie close by the museum. We coaxed the old steamer back into safe working condition and decided to treat it as a working exhibit. After some careful thought it was agreed that with safe mounting steps and temporary seating it could give passenger rides on special occasions. This was a great success from the outset, although some among us thought it a little irregular to give rides on the back of a lorry. Imagine our surprise, therefore, to discover as our researches continued, photographs of V 3507 giving rides to large groups of school children during the First World War. This old steamer had done it all before and on a huge scale. During the war government took over the railways and all pleasure excursions were banned. This was particularly significant in the Aberdeen area as the town was a vitally important port and railhead for supporting the Grand Fleet at Scapa Flow. The Great North of Scotland Railway’s network was overloaded with traffic. As losses mounted on the Western Front, Sandy Runcie stepped in and began to organise outings for local children to lift the mood and boost failing morale. He did this throughout the war with picnic excursions to local beauty spots, even carrying up to 145 people to church on Sundays. After the war this unofficial home front war work was commented on in the press. With the centenary of the start of the war on 3rd August 2014, V 3507 had its own commemoration. The waggon carried our local Minister and members of his congregation on a tour of the local war memorials where services of remembrance were held. All agreed that the old waggon was like a ‘living’ link to those dark days. It seemed like a natural thing for this particularly sociable Sentinel to do. Toy ‘Dissected Hayfield’ acquired by City of Edinburgh Council in 1975 with an NFA grant of £12. 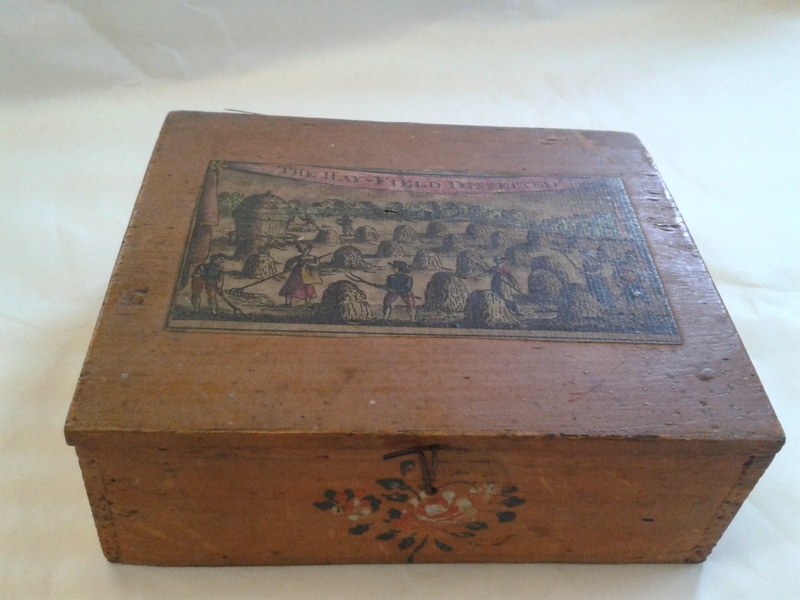 Looking through a list of objects acquired by the Museum of Childhood with NFA support, I was intrigued to see one object described as a ‘Dissected Hayfield’ and wondered what it could be. I checked its location and found it was stored with Construction Toys, which piqued my interest even more. Early jigsaw puzzles were sometimes called dissected puzzles but we normally associate construction toys with Lego, Meccano, etc. 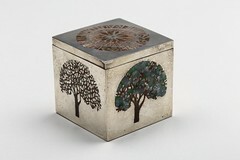 I found this simply made and decorated wooden box in the store and had a look inside. 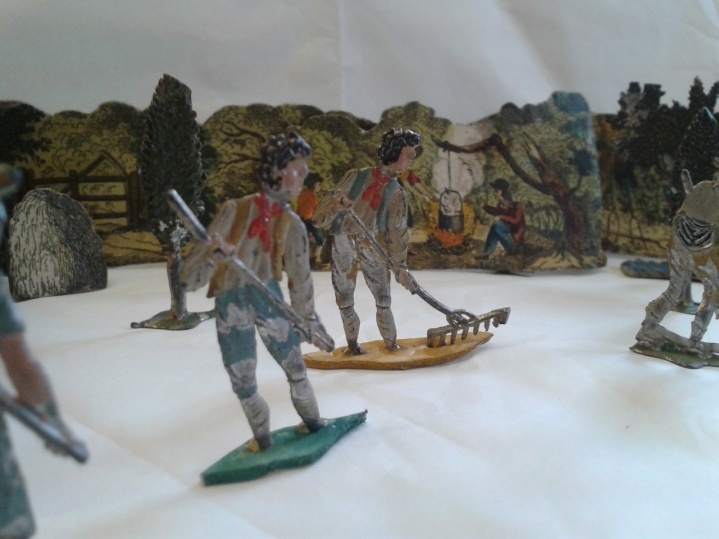 It contained a large number of painted tin figures and printed paper scenery, all on little stands so that you could set them up and arrange them as you wish. 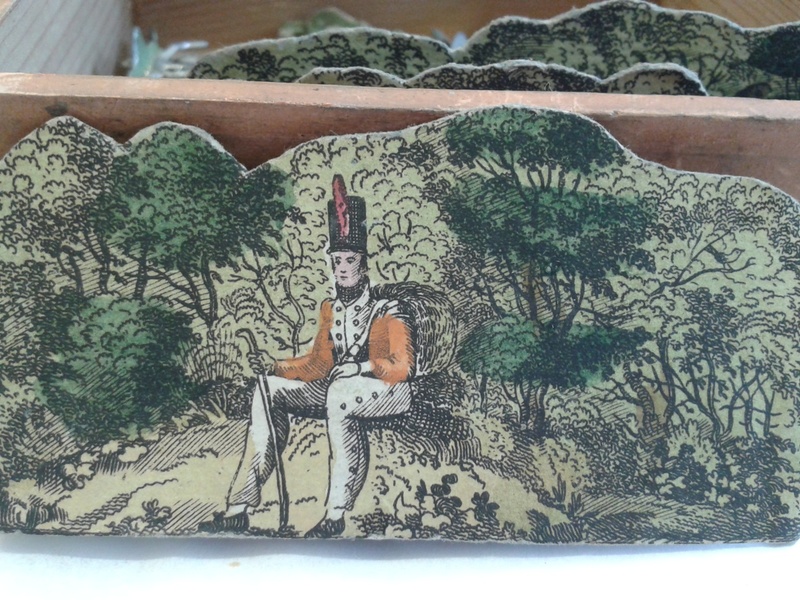 The printed illustrations on the paper, such as the haystack, were reminiscent of paper theatres and their scenery and, judging from the women’s dresses and soldier’s uniform, the toy was made around 1820-30, when toy theatres were also popular. This means the toy predated, or was contemporary with, the earliest dissected jigsaw puzzles which makes it a rare item marking an interesting development in children’s toys. This toy would almost certainly have been made in Germany which began exporting toys in the late 18th century and was the leading manufacturer of mass produced toys, often cheaply made from tin and wood, until the First World War. By 1907 Germany was using so much tin in its toy manufacturing that it had to import from South Wales and elsewhere to satisfy demand. Children’s toys often replicate what is in the world at a given time, reflecting technology, fashion, war, occupations, etc. 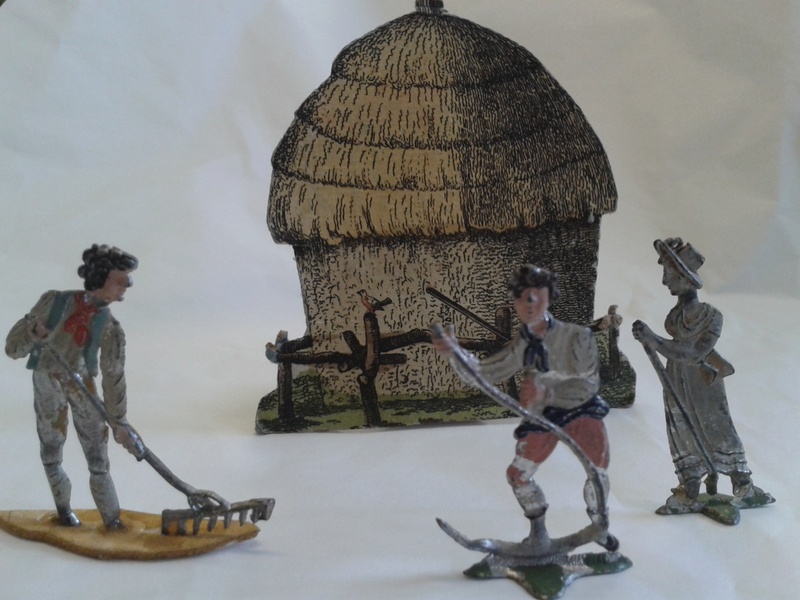 In this toy you can see what a woman, a soldier and a farm worker would have worn at this period, and the tools the farm workers would have used. Even the shape of the haystacks can give us an idea of when the toy was made. Was the toy instructional? Or purely intended for pleasure and passing leisure time? Either way it would not have been a toy for poorer children, who had to make do with homemade toys, but would have been intended for the nursery of a wealthy family with disposable income to spend on such luxuries. Many of the poorer children in rural areas would have worked alongside their families in real hayfields. 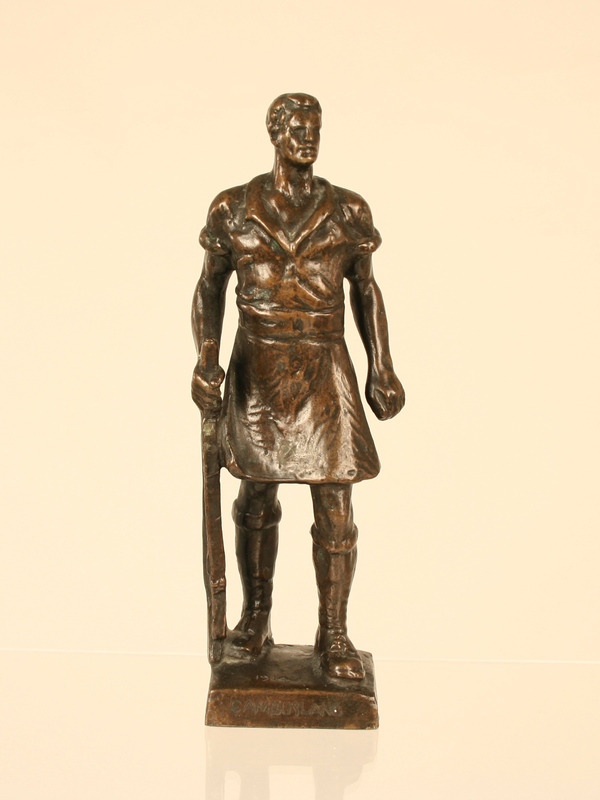 Bronze miniature, Cambuslang 1914, 1922, by Alexander Proudfoot, acquired by South Lanarkshire Leisure and Culture in 2014 with an NFA grant of £114. A couple of months ago I found myself sitting at home browsing the online catalogue of a local auction house. A listing for a statue of a soldier jumped out at me. I have a deep interest in military history so went in for a closer look. 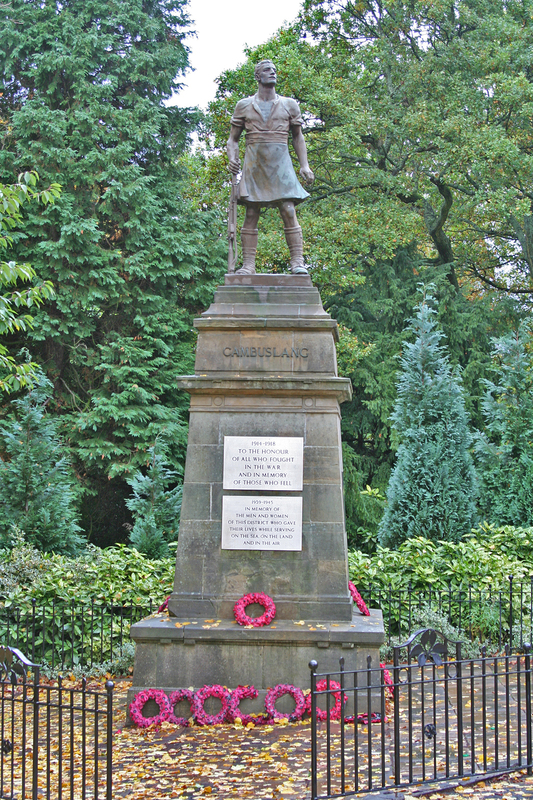 The statue was a miniature of the figure that appears on the war memorial in the town of Cambuslang. I realised this would be an interesting object for the museum collection. The statue has further local significance given that the sculptor based the figure on the first man from Cambuslang to be killed in the First World War. John McAlpine was serving in the 1st Battalion, The Black Watch Regiment when he was killed on 11th November 1914. At the time of his death, John was 37 years old, married and father to six children. Private McAlpine has no known grave and is instead commemorated on the Memorial to the Missing at the Menin Gate in Ypres, Belgium. At work, we agreed this was definitely worth bidding for, assuming funds were available. The auction was taking place in less than a week, so we had to move fast. I contacted the NFA to see if an application could be turned around in time, and was given very useful help and encouragement. I submitted the application and was duly informed that the NFA was able to offer us match funding. The day of the auction finally came. We had decided to bid by telephone and I remember standing in my garden waiting on the call, terrified that my mobile signal would fail and we’d miss our chance. Thankfully our bid was successful and we received the statue in time to display as our ‘Object of the Month’ for November. Tuesday 11th November, Remembrance Day, marks the 100th anniversary of John McAlpine’s death – with his memorial figure on display in Low Parks Museum in Hamilton, we will ensure that he and all his fallen comrades are remembered. 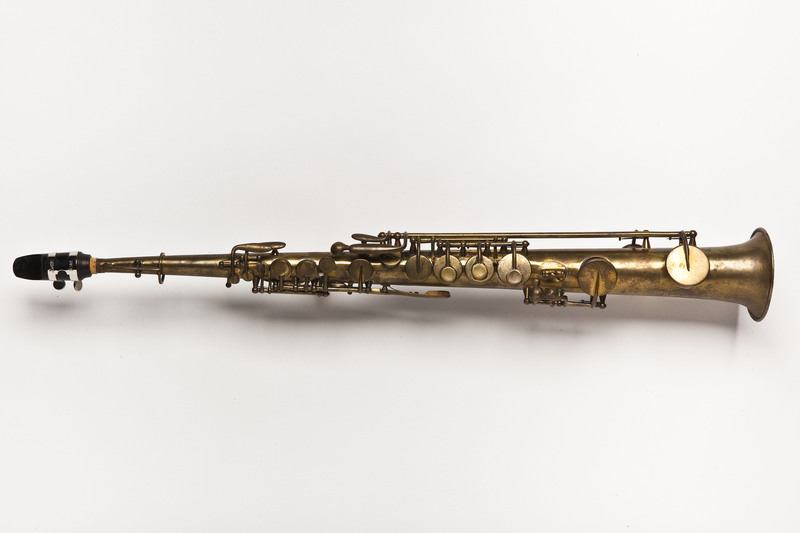 Double set of saxophones, c1856-68, by Adolphe Sax, acquired by the University of Edinburgh Collection of Historic Musical Instruments in 2004 with an NFA grant of £29,000. Though the saxophone is instantly recognisable as a symbol of jazz and swing, its prolific creator Adolphe Sax could not have imagined such 20th-century music when he invented the instrument in the late 1830s. The bicentenary of Sax’s birth on 6 November 1814 at Dinant, Belgium, is being widely celebrated this year. He experimented with saxophone while working in his father’s musical instrument factory in Brussels; in 1842 he set up his own business in Paris where the work of developing and manufacturing the saxophone took place. Of all Sax’s inventions, the saxophone was the most revolutionary and has been the most successful. The saxophone is the most important musical instrument to originate in a well-documented invention by a single innovator. 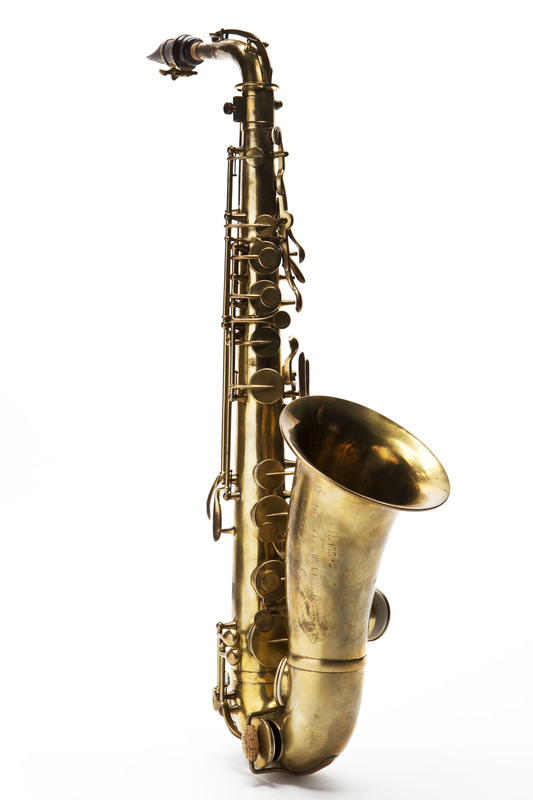 The family of saxophones of different sizes was intended to provide a robust voice for military bands and they were used in wind bands, mainly in France but also in Britain and the USA. Emerging jazz and popular dance bands found the saxophone’s power and flexibility ideal. In 2004 the University of Edinburgh, supported by the National Fund for Acquisitions, the Pilgrim Trust, the Russell Trust and the Hope Scott Trust, purchased eight saxophones made in Sax’s workshop. 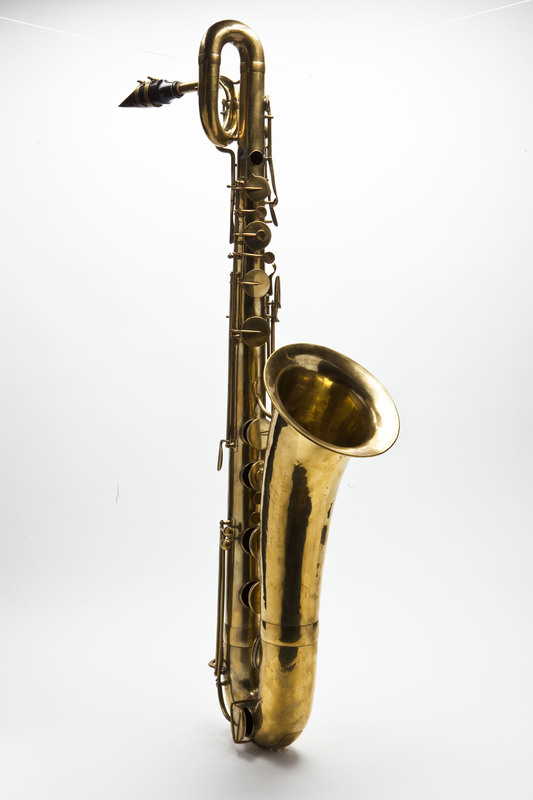 Four of these, soprano, alto, tenor and baritone saxophones, were made between 1856 and 1860 and represent Sax’s early design; the other four, in the same sizes and made between 1862 and 1868, show how Sax subtly modified the proportions around 1861. The two quartets can be seen side-by-side in the Reid Concert Hall Museum of Instruments, Bristo Square, Edinburgh.